Lexi took up the drums aged 13, and after 2 years of scraping together the pennies earned from a part-time job, she bought her first drum kit. Specialising in music performance at college, Lexi met many like-minded musicians and spent her spare time songwriting, recording, rehearsing and gigging all over the UK. Life as a touring musician had begun without her knowing. 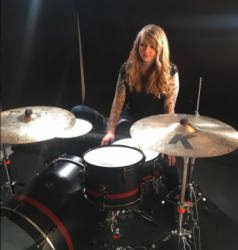 Since then, Lexi has performed at some of the most prestigious venues in the UK including Islington O2 Academy, IndigO2, Camden Roundhouse and renowned festivals such as Download, Sonisphere, Rebellion, Beach Break Live and T in the Park. I have been teaching for 8 years and absolutely love what I do. Previous employers include the BBC, tutoring CBeebies 'Zingzillas' star 'Drum'. I offer professional drum tuition to people of all ages and all abilities. Whether you’re looking for a better understanding of the drums, want to achieve your grades or simply want to play for fun, I will plan and deliver lessons bespoke to you. Prior to our lessons we will discuss potential areas of focus, what you would like to achieve from our sessions and a little bit about you and your drumming history. I am also happy to advise on equipment including sticks, drum kits, ear plugs, books and other educational tools. I teach from my own studio in central Brighton. Please contact me for the address.